Hello Judges! We have a special feature for this week’s installment of Judge of the Week. For Exemplar wave #15, Alistair Crook of England had been chosen as your Exemplar Vanguard. So we have reached out to ask him a few questions. 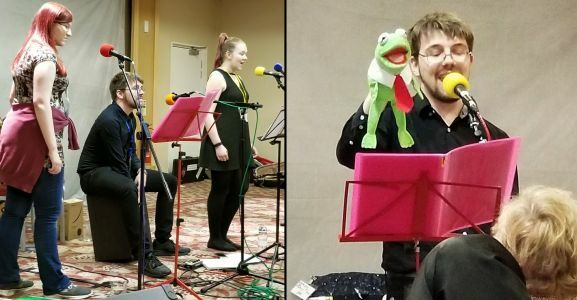 Random fact about yourself: I am a proud filker, and was invited as (one of the) guests of honour to the 2018 UK Filk Convention! I value helping other people to be happy, and enabling other people to do things they enjoy, like play Magic, is thus something I find really rewarding. Increasingly as I’ve gained experience, I’ve also found that Judges enjoy judging – who knew – and helping other Judges to get opportunities to judge and progress in the program is something I find immensely rewarding too. I’m happy making people happy, and judging gives lots of avenues to that! You have been nominated to be the Exemplar Vanguard for Wave #15. What’s it like? I’m honoured, frankly. Exemplar is a tool I’ve found really valuable in the past – I try to make a point of going through as many nominations as I can whenever a new wave goes up to see what behaviours in other Judges I should be trying to emulate – and being chosen as the face of the wave is a startling reminder that other people are looking at what I’m doing that way as well. If nothing else, it’s a good indicator I must be doing *something* right! 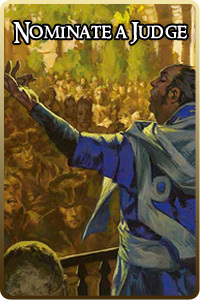 What is your involvement in the creative process for your Exemplar token art? Do you have any specific ideas on how it should look like? For the Exemplar token my involvement is suggesting what the kind of token it should be – type, power and toughness – and supplying the inimitable rk post with pictures of my face to make a card out of! I’m afraid that I’m totally devoid of all aesthetic taste, so while I was allowed to give specific ideas on what it should look like, I decided it was better to leave it up to the professionals. I’m looking forward to finding out what it looks like in the end! Your nomination for Vanguard is based on an Exemplar recognition written by Trevor Nunez mentioning your enthusiasm and great approach whenever you help new community members with their onboarding, be it on LoadingReadyRun Discord channel or anywhere else. 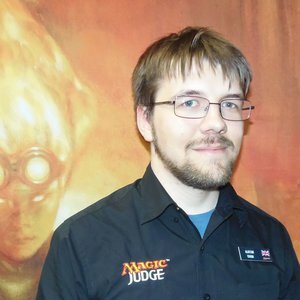 While community care is one of the common reasons for people to become Magic Judges, do you have any specific tips for Judges who would like to up their game in this matter? What works the best for you? The biggest thing that works for me is just being genuine and being energised. When talking about Magic to players, you’re talking about something that both of you love – find out what parts of the game you enjoy in common, and be enthusiastic about them. If they like brewing, talk about interesting decks you’ve checked. If they like weird interactions, pitch them your favourite weird combos. And if they like looking deeply at the rules, I’m sure judging is something you can be enthusiastic about – maybe it’s something they’d enjoy too! I know you as Phillammon more than as Alistair. I also know you as a perpetual shining beacon for Magic, and the Judge program, on the LRR Discord. Most everyone in the Magic group knows you’re a judge, and if you’re the first point of contact these people have with the program, you’re a damned good one. You’re always polite, friendly, helpful. You’re happy to talk at length about the rules, the policies, about the Program itself. I’ve seen you spark interest in it with more than a few people. I’ve seen you pull back the curtain and show others how fascinating and complex the rules can be underneath the surface, and it’s always with visible glee and interest- it’s never you lording your arcane knowledge over others, it’s you calling everyone to come look at this neat thing, and show them to love it the way you do. I wish more Judges showed such love and enthusiasm for the game, for the complexities, for the Program, and shared it with the world as brightly as you do. The game would be all the better for it. You can read more about Alistair’s selection as the Vanguard on the Exemplar Project’s blog. Definitely GP Birmingham 2017. It was my first GP on staff, as a level 1, and I spent the entire weekend on On-Demand Events. At first, I had no idea what I was doing, and it showed, but eventually over the course of the event – and after some pointers from the other Judges on staff – I got into the swing of things. Prior to that, my only experience firing events had been launching weekly drafts at my university with people I knew well, and talking to strangers was something I was entirely uncomfortable with. But there’s nothing like firing tens upon tens of drafts, sealed events, and tournaments for total strangers over the course of two days to really get the hang of fast Head Judge speeches! I came out of that event utterly exhausted, but it taught me a lot of things – not least that I wanted to judge more GPs! Winter Hughes and Henry Guille are two people who have been important mentors to me in the past. When I was first looking into judging, Winter lead by stellar example in the #mtgrules IRC channel, and was utterly inspiring. One of the biggest things that she taught me is how to interact with a community – being energised and engaging, and talking to people about what you have in common. Winter is on her own a lot of the reason I originally started trying for Level 2, months before I ever met her in person, from our interactions there, and it’s definitely shaped what I aspire to be as a Judge. Henry Guille, on the other hand, I worked with at my first multi-judge event, and have worked with at several events since, and the guidance has been incredibly valuable each time. Henry taught me the simple things, like always to bring a notebook and water to events, right through to helping me figure out what I want my trajectory through the program to look like and what I need to do to get there, more recently. The Judge Program has done wonders for my confidence speaking to new people and groups, if nothing else, and it’s also provided me with some of the best friends I could ever hope for. I spend a lot of (possibly too much) time chatting with other judges on IRC and Discord, and both in matters of Magic and of the real world, Judges are some of the best people I could hope to spend time with. Try not to be afraid to speak up. When interacting with more experienced or higher level Judges, it can be really easy when something doesn’t seem right to be scared to speak up, or to feel like they must have thought of it and are already aware. I realise it’s easier said than done, but try not to be scared, try not to assume that. A different perspective reveals things that others may have overlooked, no matter how experienced, and you speaking up might embolden others to speak up too. The proudest moment of my Judge life is definitely the moment I received my Judge badge. I’d just come off the back of my first large event – one of the last Axion GPTs – and had felt incredibly out of my depth, but loved watching the other experienced Judges working together and having fun together. It was that event that told me that the wider Judge community was something I wanted to be a part of, but I didn’t feel like I was quite there yet. Some weeks later, I got a letter in the mail with an exemplar letter for some things I’d done at the event, and in that same envelope was my badge. It was at that moment I felt like I wasn’t just someone who judges, but that I was a Judge, and a part of the Judge Program. That meant so much to me then, and it continues to to this day. I’m still new to it, but definitely cosplay. I started trying to cosplay at GP London 2018, with a terrible clown costume based on Rich Hagon’s “Shuffling Clown” segment at a recent-at-the-time Pro Tour. 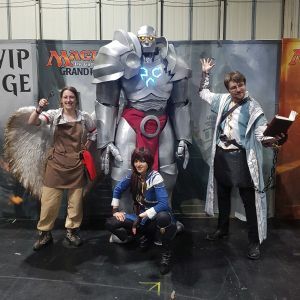 That turned out to have been a massive mistake, but still got me interested in trying to do a much better costume for GP Birmingham, where I ended up going as Raff Capashen – a bit more ambitious, but it turned out pretty good! I’ve been learning a lot about sewing and crafting from trying and failing to make various props and clothing pieces, and it’s been really rewarding generally. So now I’m looking forward to trying to put together a costume for GP Liverpool! Probably playing far more video games than are healthy… or possibly trying to make them? At university, a friend of mine, Will Seymour – unbeknownst to me a Level 2 Judge – mentioned that there were regular drafts on at the Uni TCG club, and thought it might appeal to me, knowing my love of analysing rules systems and of games generally. I suspect these days that he may have introduced me to Magic with the intention of getting me into Judging. If that was the plan, I’d say it’s worked out pretty well for me! -9: Search your library for any number of artifact cards and put them onto the battlefield tapped. Sai’s my kind of artificer, yeah. My favourite Modern deck is any deck where I can Whir for Ensnaring Bridge or Witchbane Orb and watch all hope drain out of my opponent’s eyes, so Lantern Control and Blue-Red Prison. That probably makes me a bad person. I’ve never seen any Star Wars or any Lord of the Rings film except for half of The Phantom Menace. I can sing the entirety of Buffy the Vampire Slayer’s Musical Episode, “Once More With Feeling”, from memory. John Eriksson does not bring his own pillow with him to GPs but wishes he could.